The loss of one or more teeth can affect your looks and your dental health. Teeth are designed to work together to help chew, speak and smile. With the loss of teeth, it may be difficult to do these things. Even the loss of a back tooth may cause your mouth to shift causing your face to look older. Fortunately, missing teeth can be replaced, and one of these options is with a bridge. A bridge replaces missing teeth with artificial teeth and literally “bridges” the gap where one or more teeth use to be. They improve the strength, durability and function of your existing teeth. Bridges can be made from an array of materials such as gold, alloys, porcelain or a combination of these materials. They are attached to the surrounding teeth for support and are bonded or cemented into place. It is important to act quickly after you lose a tooth. If you leave things too long, teeth may move into the gap and change your bite over time. This can lead to other problems such as jaw pain, gum disease, tooth decay and difficulty eating. Prompt treatment will minimise these possible side effects. A bridge usually takes more than one dental visit. On your first visit, our dentist will prepare the teeth on either side of the gap where the bridge will later be attached to these teeth. Our dentist will then take an impression of your teeth, which is sent away to our dental laboratory in Perth. The technicians at the laboratory make the bridge out of metal, ceramics, glass-ceramics or a combination. Before you leave your appointment, our dentist will place a temporary bridge in which protects your exposed teeth while you are waiting for the permanent one. You will then have another appointment when the bridge is ready and it is fitted to give you a look, feel and function like natural teeth. 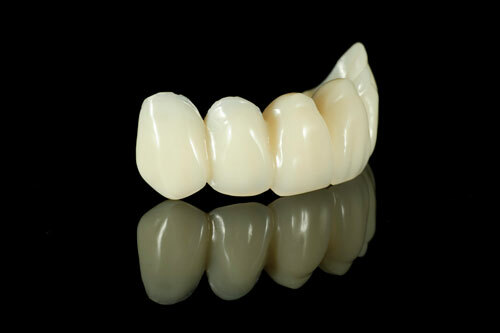 At Cathedral Dental we offer many different designs and materials for your personalised bridge. Each bridge is individually crafted by our experienced team of dental technicians to create an appearance that is both natural looking and healthy. All our bridges carry a 5-year manufacturers warranty.